While it feels a bit too much like Act IV, Part II at times, Act V is still another magnum opus. With last year’s masterful Act IV: Rebirth in Reprise, Dear Hunter mastermind Casey Crescenzo and company embodied their newest subtitle musically as much as they did narratively, for the record housed the band’s signature fusion of several styles -- including chamber music, folk, progressive rock, indie rock, and piano ballad -- within an enhanced focus on interconnected transitions, lavish orchestration, and Vaudevillian performance. In some respects, it felt like a real stage show with proper scenes and segues, which meant that it was as much the first entry in a new direction as it was the fourth entry in the ingenious conceptual saga. It comes as no surprise, then, that its successor, Act V: Hymns with the Devil in Confessional -- which, as Crescenzo said on the official Dear Hunter website, was “written and recorded much in the same time frame” as Act IV -- essentially follows the same sonic path; in fact, it feels more similar to its immediate predecessor than any album before it did (so don’t be surprised if it sounds like Act IV, Part II upon the first few playthroughs). Of course, that’s not necessarily a bad thing, but it’s nonetheless fortunate that the LP eventually reveals its own identity with subsequent listens, ultimately standing as another nearly immaculate sequence. Although Act IV is a tad superior, Act V is still an overwhelmingly remarkable work that further demonstrates why the Dear Hunter is one of the most distinguishing, striving, and reliable groups of its time. Despite being created almost simultaneously (and having only a year between them in terms of release), “each album retains its own unique identity, tone, and experience”, as Crescenzo clarifies. If Act IV was a warm Broadway gala, Act V is its more melancholic Western counterpart. In addition, he specifies that this one “will be the final ‘rock’ record in the Act series... [because] knowing what Act VI means to the series, and what its story has to say... [means that] presenting it in the same form as Acts I-V would be short selling the creative opportunity it presents”. If Act V truly is the end of the musical palette fans have come to adore, it’s definitely a satisfying way to go out. In contrast to the bombastic movements and/or elaborate vocal counterpoints that kicked off its predecessors, opener “Regress” offers one of the sparsest and shortest, yet most intensely bittersweet, tracks the band ever cut. Mournful acoustic guitar arpeggios, harps, and strings adorn angelic harmonies as Crescenzo issues ominous lamentations. It’s a breathtaking beginning that, coupled with the colorful power of its follow-up, “The Moon/Awake”, whose hypnotic riffs, rhythms, and melodies almost generate the same level of catchiness as Act IV’s “Waves”, instantly showcases how impactful the record will be. A celebratory collage of alluring instrumentation, dynamic swings, and foreboding but poetic lyricism -- such as “I’d bear you my heart if I knew that it still was there / I’m too nervous to look / Too afraid to close the book / So take all the wind from my lungs if you’re out of air / Just deliver me truth / Deliver me you” -- the latter selection is stunningly robust, emotional, and varied, attaching itself to your ears and heart with ease. It’s a masterpiece onto itself. “Cascade” is slower and more piano-driven, with a keen air of panicked romanticism. Vocally, Crescenzo once again illustrates his amazing range, as he alternates between soft regrets and raucous outcries effortlessly; likewise, the constant symphonic foundation moves between faint accompaniment and -- especially near the end -- gorgeous, encompassing sorrow. Afterward, the tempered “The Most Cursed of Hands/Who Am I” starts with the oscillating notes of Pink Floyd’s “Goodbye Cruel World” before coating its Gunslinger narrative in Old West ferocity, blending backing vocals and hard rock riffs and rhythms into a volatile score before the final moments change course completely, transforming into a trepidatious slice of self-reflection. Like “A Night on the Town” before it, lead single “The Revival” is the showpiece of the LP, with its explosive, ever-changing arrangement and infectious melodies decorated by bits of flamenco guitar, female croons, and zany effects. It’s spotlessly contained yet seemingly unrestrained and festive, making it a very joyous entry. Conversely, “Melpomene” is a beautiful ballad with dense singing, heavenly music, and endearing sentiments, whereas “Mr. Usher (on His Way to Town)” proves to be among the most delightfully atypical tracks here; it’s as if Crescenzo and company are performing at a noirish jazz piano bar in the 1950s, complete with unique timbres like horns, washboard percussion, and female backing singers. Like every other similar instance, its concluding classical section serves as a tasteful transition into the dramatic “The Haves Have Naught”, during which two males perform simultaneous soliloquies as if they’re leaving the audience with a cliffhanger before an intermission. It’s superb. Recalling the touching drive that ended Act III: Life and Death, “Light” is an awe-inspiring acoustic guitar ballad revolving around a father and son. Its subtlety complements its sincerity, as Crescenzo pours his soul into lines like “Boy, someday I hope I do / See the man you will grow into / And when your heart’s in disarray / Know that your father, too, has made mistakes”. Like comparable past entries in the Dear Hunter’s catalog, “Light” highlights Crescenzo’s brilliance as a songwriter. Next, “Gloria” is more upbeat and full, with one of the catchiest choruses the group has ever spawned. In addition, its midsection features some truly intricate musicianship and eccentric timbres, which is a nice touch. The duo of “The Flame (is Gone)” and “The Fire (Remains)” is tense, vigorous, and dynamic, with great energy throughout and faint likenesses to parts of The Color Spectrum. As for “The March”, it’s a quick and enthralling burst of theatricality with Southern edge and symphonic elegance, while “Blood” is intense yet fragile, with more standout vocals and narrative prowess. Finally, “A Beginning” is a poignant and captivating finale with an abundance of stylistic shifts. Crescenzo’s woeful decrees are perfected by more remorseful regality during its first half, while the concluding section is more cathartic and dreamy, culminating in arguably the most commanding conclusion to an Act entry yet. It’s damn near impossible not to smile during the last few moments (especially if you’re a longtime devotee). Along those lines, and without giving anything away, listeners hoping for some conceptual continuity will be quite satisfied, as Act V continues the tradition of referencing past albums in ingenious ways. In fact, while some instances are quite overt, others are extremely understated (so they may take several playthroughs to catch). Either way, this continued penchant adds another layer of ambition and intelligence to the affair, and it’s another reason why the album is a work of art. As hyperbolic and fanboy-esque as it may sound, Act V: Hymns with the Devil in Confessional is another magnum opus. Although it doesn’t show as much evolution as it could, it’s still a monumental achievement because the formula it maintains (which was established on Act IV) is still beyond belief. Crescenzo has always been an outstanding singer/songwriter/storyteller/composer, and the fact that he’s only gotten better over the years is downright extraordinary. 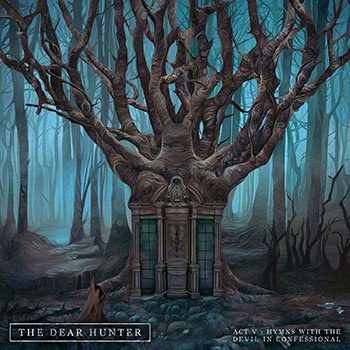 Act V contains some truly magnificent melodies, lyricism, arrangements, and range, proving once again why the Dear Hunter is in a class all its own. With any luck, Act V will finally get the band the widespread acclaim and attention it’s always deserved.